Hatch | Have YOU Ben Starr Struck? 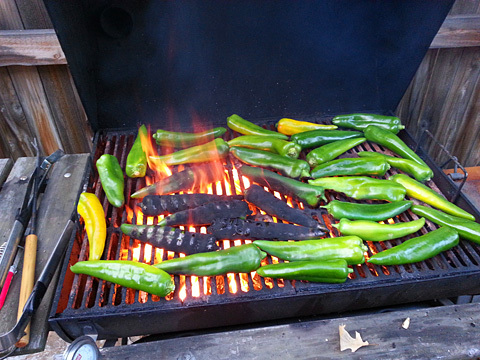 Yesterday I posted this photo of Hatch green chiles flame roasting in my backyard. A number of folks were VERY concerned about the chiles in the center, which are completely black. But those chiles look that way intentionally. Allow me to explain. Some chiles have such a thick skin that they need to be peeled before being included in recipes. The larger chiles, like Anaheims (to which the “Hatch” chiles belong), sweet bell peppers, and poblanos, all require peeling, otherwise, their skins toughen during cooking and give an unpleasant texture to your dish. Smaller peppers like jalapenos, serranos and habaneros don’t need to be peeled, though they can be if you wish. There’s a problem with this method, though it’s been used for centuries. When the pepper’s flesh cooks, it exudes flavorful juices. When you are peeling the pepper, and again when you cut it open to seed it, handling the flesh causes those juices to spill out into the sink, all over your hands, and onto the cutting board. Meaning…flavor lost. Flavor that SHOULD be in your pot. Several years ago, I discovered that roasting chiles over a screaming, flaming fire caused their skins to burn to a crisp, while their flesh is still nearly raw. Meaning…no lost juices. Plus, traditional blistering of the skin often leaves undercooked areas of skin that don’t come off when you peel them, and peeling off strips of wax-papery skin is tedious. When the skin is truly charred black, it crumbles off like dust when you run your hands down it as if you’re milking a cow, especially if the flesh is still firm rather than cooked. A few little black pieces may stick to the flesh beneath, but they’ve been so charred that they’ve lost all their toughness, and will simply add deep, smoky flavor to your dish. So next time you have a big batch of chiles to peel, fire roast them over high flames, carefully turning them to make sure they are thoroughly burnt all over. This should happen in no longer than 2 minutes, often far less, depending on the temperature of your fire. Use wood, not charcoal. Small pieces, like fallen sticks from your tree, will light quickly and burn hot, and you won’t waste any wood, because the roasting happens so quickly. Remove the hot peppers to a big plastic bag or a covered pot for a few minutes. Then carefully spread them out on a table to cool. They will peel instantly, but the flesh will still be firm, so you can cut it open and scrape out the seeds without worrying about losing all your flavor! When peeling hot chiles, it’s a good idea to wear rubber gloves, as the waxy capsaicin buries itself in your skin and can burn for hours after. (And that burn can spread to your eyes if you rub them, or other uncomfortable places after a trip to the bathroom!) Capsaicin is alcohol soluble, so if your hands are burning after peeling chiles, wash them vigorously with rubbing alcohol or hand sanitizer, which will hurt extra bad because of the sensitivity. Dry them vigorously with a towel, because mechanical friction will also help remove the waxy compounds. While we’re on the subject of Hatch chiles, a little education may be in order, as these delights seem to only be widely known in the states surrounding New Mexico. 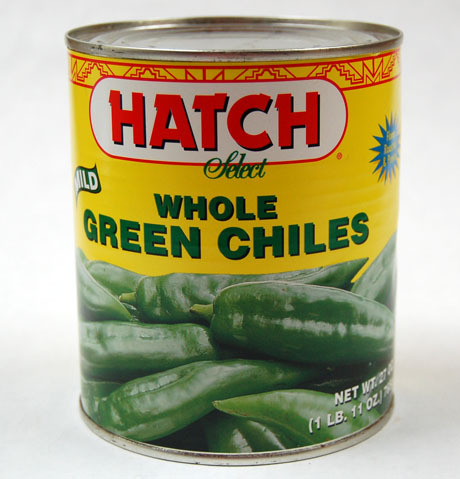 Hatch isn’t a variety of chile. It’s a town in south-central New Mexico that has a unique climate for raising chile peppers. A number of Anaheim-related varieties (NM 6-4, Big Jim, Sandia, and Lumbre are the most common, listed in order from mildest to hottest) grow particularly well in the sandy soil, but Hatch’s intense sun (averaging 360 days a year) and daytime heat give the chile plants a growth spurt, but chilly nights slow down the pepper development. This alternating hot-cold-hot-cold repetition slows and extends the growing cycle and results in a pepper with thick flesh and intense, consistent flavor from year to year. The secret is getting out, and Hatch chiles are being shipped to gourmet markets in far-flung San Francisco, Chicago, and New York. Some local companies roast and freeze the peppers for shipment around the world all year long, like this website. One company cans them and you can buy them at many supermarkets in the Mexican ingredients section, however, frozen is preferred to canned. Hatch chiles are seasonal…they start showing up fresh in grocery stores in late August or early September, with the bulk of the supply peaking in mid to late September. By early October, they’re gone until next year. So if you run across a box of Hatch chiles in your supermarket, buy them all and roast and freeze them to use throughout the year. I normally buy 20-30 pounds a year. Hatch chiles can be used in ANY recipe that prominently features sweet or hot chile peppers. Chiles Rellenos (whole peppers stuffed with cheese and/or meat, then breaded and fried, or oven roasted) are a classic choice. But my favorite way to eat it is in Green Chile Stew, patterned after New Mexico’s version of pork chili verde. My recipe isn’t quick or easy, but it’s delicious. I make several gallons of it, and now that word has got out, I rarely have any left to freeze, but it does freeze beautifully for future use.